Below are hot questions that teachers frequently ask me about classroom management. 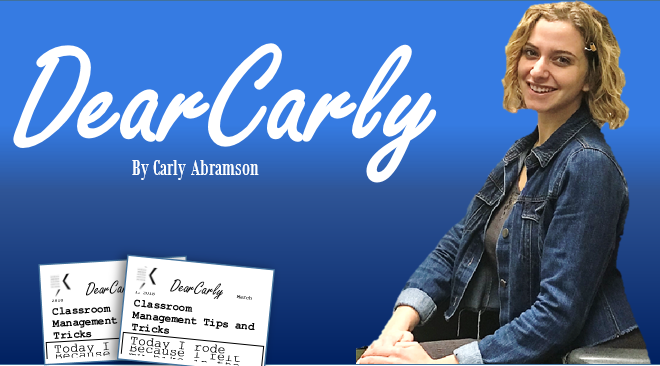 I know managing a classroom can be tough, so I hope that my advice can be useful to you. At the start of every school year, I create a b’rit k’hilah (community covenant) with my students. At first, the students respect, or at least try to respect, the rules we choose. However, somewhere along the line, the b’rit k’hilah always seems to fall by the wayside. Before long, it feels like we disregard it entirely. How do I hold students accountable to our b’rit k’hilah seriously throughout the entire year? Excellent question. I found in my own classroom experiences that the b’rit k’hilah can succumb to the more-bark-and-less-bite reputation. We as educators often assume that students will follow the class rules because, well why would they not follow rules they chose to abide by? The answer lies in the difference between instilling versus enforcing classroom rules. Instilling is when you simply create a list of rules without an incentive that makes students want to follow them. Enforcing is when rules are established, and there are clear rewards and/or consequences for obeying them. For example, if a rule in your class is no texting and a student chooses to ignore said rule, there should be a repercussion for their actions as opposed to empty warnings. In sum, when creating a b’rit k’hilah try practicing the enforce method by not only including clear incentives/consequences but sticking to them. I have a student who constantly finishes their work before the rest of the class. Not only is the student left with nothing to do, but it often becomes a distraction to the other students because they immediately lose their momentum in the activity. How do I keep the student who finishes their work early occupied, while keeping the other students on track? You are not alone in this. For the student who finishes the activity early, do not be afraid to ask them if they have truly finished their assignment. If they have, then it is important to have optional activities that they can complete on their own that are not too distracting. Examples of these could be a word search or a puzzle. If the student is consistently finishing their work ahead of the other students, then maybe giving them assignments that are a bit harder and more time consuming might be beneficial for them. You can also take inspiration from 7th grade and develop long-term projects for your students. Any time any of them have some “free” time, they can work on this project. I have students that never participate, and I also have students that participate too much in our discussions. Do you have any advice on how to solve this issue? In fact, I do! There are many ways to deal with this, and the word to remember is “protocols.” Protocols are ways in which you structure discussion. Are you asking the students to raise their hands? Are you having students write their answers on a piece of paper and then the teacher reads the responses aloud? Protocols can ensure every voice is heard. A fun protocol I like is a Popsicle® trick technique that has proved to be successful in classrooms. The Popsicle® trick is quite simple. You would give each student a certain number of Popsicle® sticks (that number is up to your discretion). Each student must get rid of their Popsicle sticks by the end of class, and the only way to get rid of their Popsicle sticks is to participate in class. Participation could mean answering questions, participating in discussions, or any other active interaction with the entire class that you determine.